The hippocampus is a structure nestled in the center of the brain known for its central role in memory and learning mechanisms. It is also the first area that degrades in Alzheimer's disease. While several studies have established atlases of the human hippocampus, few studies using MRI have been conducted to date to characterize its organization at the mesoscopic scale, at around a hundred micrometers of resolution. As part of their work within the Human Brain Project, researchers of the Neurospin center in France, part of the Life Sciences Frédéric-Joliot Institute of CEA, in collaboration with Forschungszentrum Jülich in Germany, have imaged a post-mortem human hippocampus with NeuroSpin's 11.7T preclinical MRI at unequalled resolution and based on new diffusion MR microscopy approaches to characterize their cellular composition. The researchers used an 11.7 Tesla UHF-MRI system equipped with powerful gradients able to deliver up to 780mT/m allowing large diffusion sensitizations while preserving a short echo time. 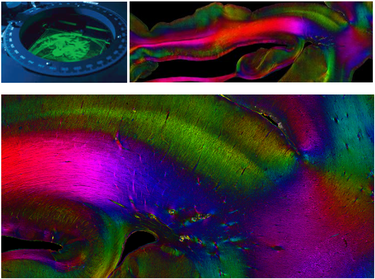 Subsequently, high resolution microscopy methods will be used on the same post mortem hippocampus sample, to better understand the hippocampal organisation at various scales. "We benefited from a very high field MRI system which, combined with very high gradients (780 mT/m), allowed us to obtain anatomical images with a resolution of 150 micrometers. 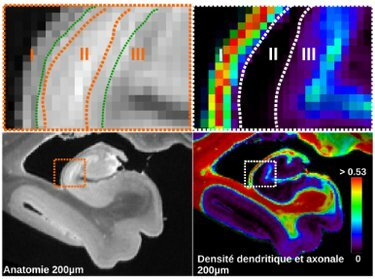 With diffusion MRI, a method to explore the structural anisotropy of tissues, like when investigating the brain's connectivity, we achieved a resolution of 300 micrometers, 30 times more precise than with the MRI-scanners used in hospitals," explain Justine Beaujoin and Cyril Poupon, researchers at the Institut Frédéric-Joliot and principal authors of this study. The purpose of this technology is not only to segment the substructures of the human hippocampus, but also to reveal the neural interconnections within it and to determine cellular characteristics, such as whether a region is rich in neurons or dendrites for example. The images make it possible to obtain a very precise segmentation of the internal regions of the hippocampus and to measure with great reliability the connections between them, add the two researchers. Using advanced models of the diffusion process, they can also be exploited to characterize the cellular composition of these regions. This study performed on a post-mortem sample shows the full potential of the future 11.7T clinical MRI that is being installed at NeuroSpin. “Visualizing the hippocampus in high definition, the first area of the brain affected in patients with Alzheimer's disease, will undoubtedly lead to major advances in diagnosis and treatment development," says Cyril Poupon. He concluded: "Next, the studying of this hippocampus sample will continue in Germany, where Jülich's researchers are using Polarized Light Imaging (PLI) to map the connections of the hippocampus with a resolution of up to 1.3 micrometer in the plane in order to compare the results obtained from the two imaging approaches. This collaboration is part of the HBPs strategy to improve our understanding of the brain by bridging between different levels of brain organization. To this end the project has set up specific strategically chosen projects that develop approaches, tools and workflows to bridge either between different “modalities” (aspects) of brain organization, e.g. between gene expression and microstructure. Or the approach can be to link observations on different size scales within one modality, in this case with respect to connectivity. “By using techniques with very different resolutions on one and the same sample we can address the brain’s connectivity at micro-, meso- and macroscale, and avoid uncertainty from intersubject variability”, explains Markus Axer from Forschungszentrum Jülich. In addition to these preliminary results the Paris team has already started, in collaboration with researchers at the University of Tours, a project to scan an entire brain with a resolution of 100 µm for anatomy and 200 µm for diffusion MRI, which will require nearly a year of acquisition. These data will be unique in the world and will undoubtedly allow new discoveries to be made about the organization of the human brain at the cellular level. The high quality data from this and other areas of HBP experimental work is being integrated into a multiscale, multimodal framework to construct the most comprehensive atlas of the human brain to date. Neuroscientists and supercomputing experts work together to handle the extremely large datasets that are being generated by modern neuroscience, pioneering the technology and workflows for investigating the brain with High Performance Computing. The resulting atlas and analytics tools are available to researchers around the world through their web browser. Beaujoin J et al: Post-mortem inference of the human hippocampal connectivity and microstructure using ultra-high field diffusion MRI at 11.7 T. Brain Struct Funct. 2018 doi: 10.1007/s00429-018-1617-1. The new MRI magnet installed at NeuroSpin research facility at the CEA's Paris-Saclay Center (Essonne) generates a magnetic field of 11.7 tesla. It allows for MRI images of the human brain in ultra-high resolution. Polarized Light Imaging (PLI) is a high-precision method developed at Forschungszentrum Jülich in Germany. The images above show the hippocampal connectivity as seen with the method. Colors code for the direction of the fibres.